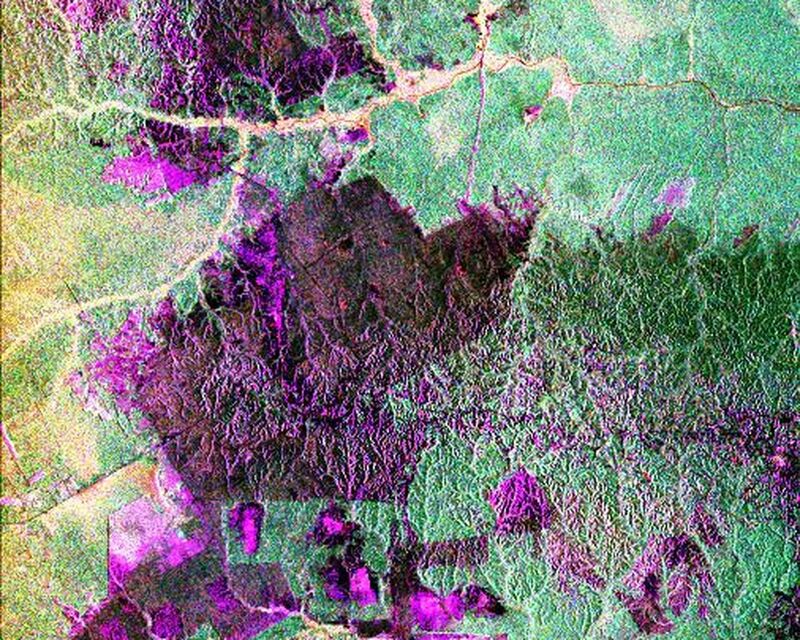 This is a radar image of the central part of the island of Sumatra in Indonesia that shows how the tropical rainforest typical of this country is being impacted by human activity. 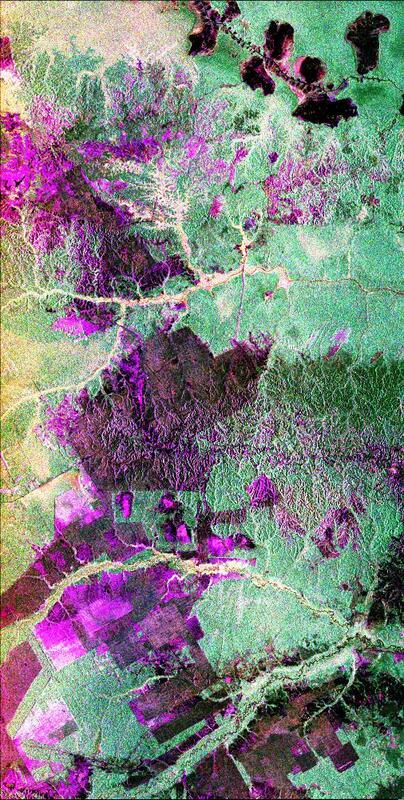 Native forest appears in green in this image, while prominent pink areas represent places where the native forest has been cleared. The large rectangular areas have been cleared for palm oil plantations. The bright pink zones are areas that have been cleared since 1989, while the dark pink zones are areas that were cleared before 1989. 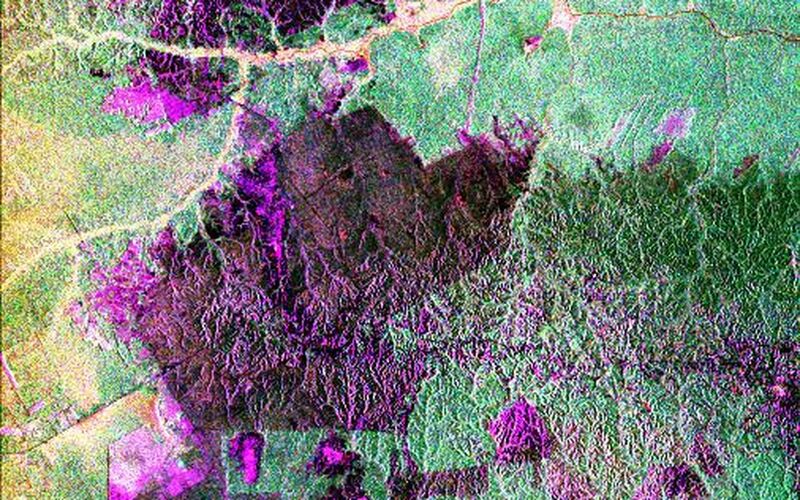 These radar data were processed as part of an effort to assist oil and gas companies working in the area to assess the environmental impact of both their drilling operations and the activities of the local population. 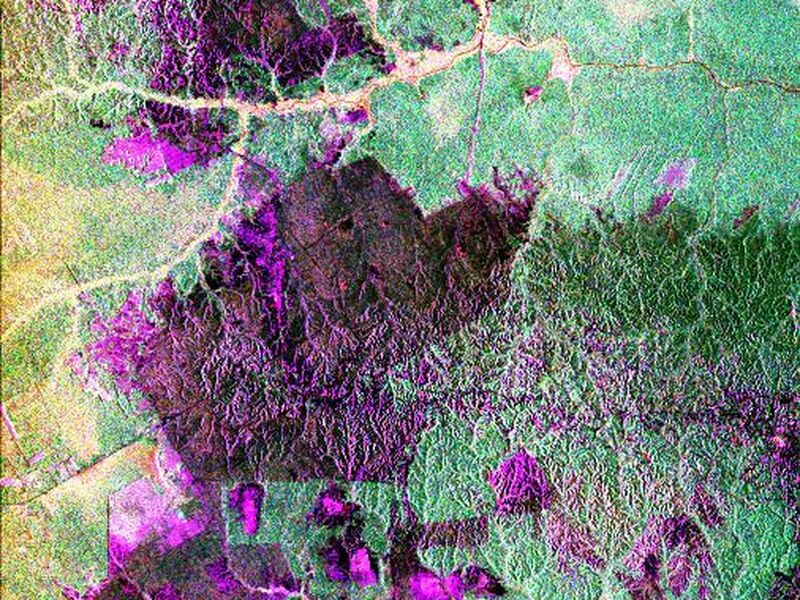 Radar images are useful in these areas because heavy cloud cover and the persistent smoke and haze associated with deforestation have prevented usable visible-light imagery from being acquired since 1989. The dark shapes in the upper right (northeast) corner of the image are a chain of lakes in flat coastal marshes. This image was acquired in October 1994 by the Spaceborne Imaging Radar C/X-Band Synthetic Aperture Radar (SIR-C/X-SAR) onboard the space shuttle Endeavour. Environmental changes can be easily documented by comparing this image with visible-light data that were acquired in previous years by the Landsat satellite. The image is centered at 0.9 degrees north latitude and 101.3 degrees east longitude. The area shown is 50 kilometers by 100 kilometers (31 miles by 62 miles). The colors in the image are assigned to different frequencies and polarizations of the radar as follows: red is L-band horizontally transmitted, horizontally received; green is L-band horizontally transmitted, vertically received; blue is L-band vertically transmitted, vertically received. SIR-C/X-SAR, a joint mission of the German, Italian and United States space agencies, is part of NASA's Mission to Planet Earth program.